A starting rate of $12.93 per page is not a bad deal at all, and can actually be considered a reasonable rate for high quality content. 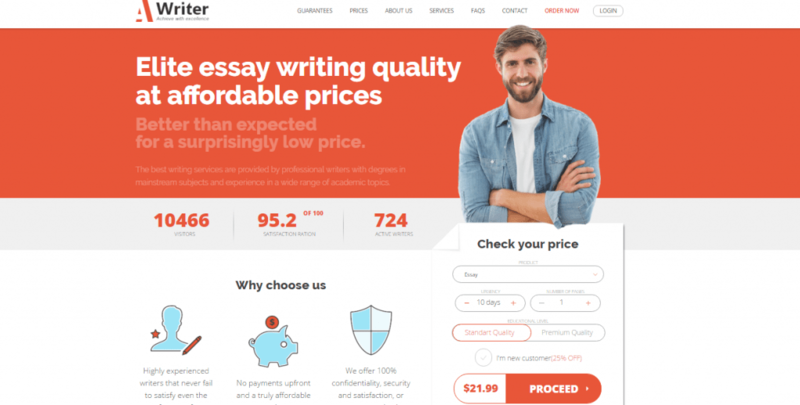 Still, affordable rates are not and should not be the only reason why you choose a writing service, which is why we decided to evaluate the company and write our own, unbiased customessayorder.com review. The creators of customessayorder.com failed to create a services list on the website, but you can check if they have your paper in the ordering form. At first, we thought the list is very limited since the number of options there is very small, but you can actually choose the option other and write the specific requirements for your paper. This is good news for those looking for a regular provider, since this is one of the companies that seem to be writing all kinds of papers. So, if the prices and quality are satisfactory, you won’t have to look for another service every time you have a paper that’s not in their list. The abovementioned price applies to a paper for undergraduate level and a deadline of ten days. To give you a clearer idea as to what the prices are like here, we checked how much this paper would cost if ordered within a shorter deadline and for a higher academic level. An essay for Master’s academic level and a deadline of 3 days would cost $25.47 per page. These prices are realistic as long as there are discounts and loyalty program for returning customers. Fortunately, you do get a first-time discount of 15%, as well as the opportunity to get 5%, 10% and 15% lifelong discount on future orders. The disadvantage here is that the loyalty program does not start after a specific amount spent or pages ordered, but after the ‘third order’. This means that for the second and third order, you’d have to pay the full price, while for the third one and those that follow, you get only 5%. You will finally be entitled to ASK for 15% discount after 10 orders. Unfortunately, we did find testimonials from students who claim such requests were rejected, and this discount applied much later. Without quality content, the fact that the prices and services here are good is not even close to enough for you to choose the company. To determine this, we ordered an article from the service, and sent out some very specific requirements in terms of reference style and number of sources to be used. The paper was delivered on time, but we were very unhappy with the writer’s work. Our article did not make any sense in many parts, we found a concerning amount of plagiarism in it, and the paper was not at all proofread or formatted. Customessayorder.com is a legit service that offers a variety of papers at affordable rates, but they have a very bad reputation in terms of content quality. Our experience with the service confirmed the testimonials online, leading us to conclude that Custom Essay Order is not a great choice for your academic assignments.